See the manual page for Multiple tabs for full details on tabs and how to use them. You no longer see duplicate results after case-only renames on filesystems with 8.3 filenames disabled. Thanks, Alan. Fixed a crash trying index a directory for which you don’t have read permission. Thanks, Jools. Files using Mac line endings are now indexed properly. Thanks, Keith. 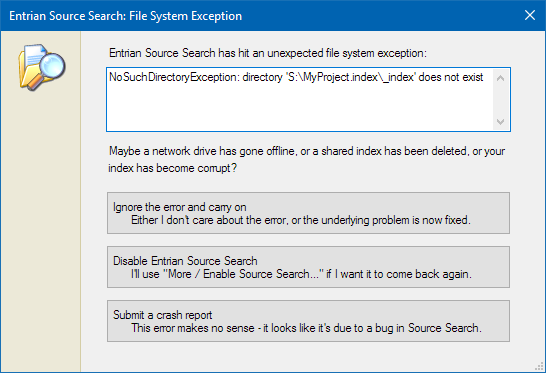 The “Unexpected IO Exception” dialog now works for the indexer as well as the searcher, so if the indexer hits a transient file system problem, you get a chance to retry. Thanks, Eddie. Fixed a crash when using the “Previous Hit” hotkey for a file: search. Thanks, Sam. Fixed a rendering glitch in the results list for long source lines beginning with tab characters. Thanks, Anders. The settings file is no longer truncated if the disk is full when Source Search tries to write to it. Thanks, Martin. If you try to create an index, find that there’s already one of that name, and ask to recreate it, you no longer get a silly error telling you that the index already exists. Thanks, Martin. All of the controls in the crash dialog now render clearly in the High Contrast theme. Thanks, Martin. Fixed a rendering glitch in the results list when using the editor font on a High DPI display. Thanks, Chris. Indexing is now done by an external process, rather than within the Visual Studio process. That means no more sharing of one increasingly-cramped 4GB address space between Visual Studio and the Entrian indexer, which is good news for anyone who’s ever suffered an OutOfMemoryException at the hands of Source Search. This change also introduces the -watch switch to the command line tool ess.exe. When you pass that switch to a create or update command, ess.exe continues to run at the end of the update, watching for changed files and updating the index as they change. That means you can use ess.exe to keep an index up to date just as you would a Visual Studio session (which is in fact what Source Search itself is now doing behind the scenes). As always, the upgrade is available for free to all licensed users, and as a 30-individual-day trial for everyone else. You can download it from the download page or the gallery. Fixed a crash (“DRAGDROP_E_NOTREGISTERED”). Thanks, Jeffy and Frédéric. Scanning for changed files is now faster. If your query is a single phrase starting with a minus sign, eg. -200, that’s interpreted as a negative filter (“show me all the files that don’t contain 200“) but that’s probably not what you meant – you now get a warning suggesting you might need quotes. Thanks, Anders and the other person whose email I can’t find for the life of me. Sorry about that last one… if you feel you can live without the kitten-pasting feature, you can download this new version from the download page or the gallery. If you’d rather stick with version 1.7.5, I totally understand. Searching now happens in a background thread, with a Stop button. Accidentally searching for a semicolon no longer locks up Visual Studio for a few seconds. :-) Thanks, Jeremy. Improved performance of multi-token wildcards in cases where the query includes two or more of them. Removed an unnecessary lock between the indexer and the searcher, which meant that searches could take longer than necessary when indexing was happening. The text in the Search box is now clearly visible on High DPI displays (broken by query syntax highlighting in the previous version). Thanks, Hans-Peter. The query syntax highlighting colors are now more visible in dark themes. The Home and Left keys now work when you have a query text selection that ends at far left of the query (also broken by query syntax highlighting). Search warnings (eg. “Per-line wildcards not fully ready: Update incomplete”) are now printed by the command-line search tool (ess.exe). Made the Search box wider when the display is wide enough for it. You can download this new version from the download page or the gallery. Single-line multi-token wildcard: this * that – the asterisk is on its own, and matches any number of tokens on the same line. Multi-line multi-token wildcard: this *:10 that – rather than being limited to a single line, these wildcards are explicitly limited to a number of tokens, and can span multiple lines. Query syntax coloring, and results coloring: in the Search box, positive filters are now shown in green text, negative filters are shown in red text, and multiple search phrases are shown with different colored backgrounds with matching colors in the results list. The Ctrl+Alt+C shortcut key in the results list or the search box copies the result list to the clipboard as text. Thanks, Anders. Ctrl+Del in the Search box does delete-word-forward. Thanks, Dylan. The existing Ctrl+H and Ctrl+L shortcuts for History Back and History Forward now appear in the tooltips. Thanks, Martin. The match-highlight background rectangles in the results list no longer escape their bounds and paint over the other columns when “Work like grep” is enabled and the results list is narrow. Where your query matches only one result, it’s now optional whether to automatically open that result. You can control this independently for text searches and for filter-only searches like file:renderer. Thanks, Peter. The way the history works is improved. Search for A then B then C, go Back, Back, Search (for A), search for D, then go Back. You now see A rather than C. Previously, every time you searched for something new, it then took longer and longer to return to A, B, etc. Now, searches that come from the history are promoted to the end. (But note that going Back, Search, Back, Search, Back, Search will still go C, B, A.) Thanks, Chris. You can now re-enable Source Search after a crash, without restarting Visual Studio, using the “More / Enable…” command. Fixed a crash when the option to “Work like grep: show one result line per source line” is enabled and there are multiple overlapping results on a single line (eg. searching for a.a where the source contains a.a.a). Source Search once again works on machines with FIPS compliance enabled. (Deja vu? Yes, I fixed this in January 2013, but it crept back in). Improved memory usage, reducing the chances of an OutOfMemoryException. Thanks, Fred.